Home › Beautifully Detailed Meissen Porcelain Candlestick Holder. Beautifully Detailed Meissen Porcelain Candlestick Holder. Originally situated in Dresden, in 1710 the factory was moved to the Albrechtsburg in Meissen, where it was more secure and easier to guard the secret of hard paste porcelain. Initial production was, for the most part, red Bottger stoneware and some of it was marked with incised Chinese characters. It wasn’t until 1713 that true Meissen porcelain began to take the place of this stoneware. In 1719, after the death of Böttger, Höroldt took charge of the factory. He was brought to Meissen from Vienna by Samuel Stölzel and created a rich palette of enamel colours to be used in decoration. Höroldts work is known as the chinoiseries and included typical scenes from the orient. In 1732 around 92 people worked for Meissen porcelain, among them the famous modellers J.G. Kirchner and J.J. Kändler. On the 7th of April 1723, the Leipziger Post Zeitungen announced that the Meissen wares would carry a mark to guard against forgeries. Forgeries had started appearing and were mostly minor damaged pieces, rejected by Meissen, but decorated by home painters. Initially, the mark took the form of the letters KPM (Königliche Porzellan Manufaktur) in underglaze blue. From 1756-1773 Meissen porcelain was marked with the crossed swords with a dot in between the cross pieces and the period was known as the dot period. This period marked the transition towards the neo-classical style. en Höroldt and Kändler retired, Michel Victor Acier was appointed as the master modeller. During Acier’s production period, mythological figures dominated. The dot-period was followed by the Marcolini-period, named after Count Camillo Marcolini who became director of the company in 1774 and he held this position until 1814. The Meissen production from this period was marked in underglaze blue with crossed swords and an asterisk in between the cross-pieces. The Marcolini period ended in a crisis for the factory and its debts were enormously high. 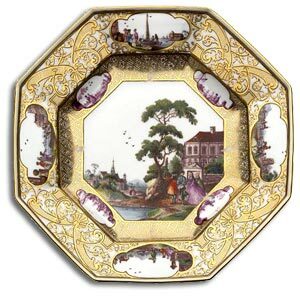 During the next ten years, attempts were made to improve the Meissen business: technical innovations were introduced and wares were made in the popular taste at the time and from that point, things started to improve. In 1830 the name of the factory was changed from Königliche Manufaktur to Staatliche Porzellan Manufaktur. The Meissen factory is still operational today and is producing the worlds’ most expensive porcelain. Superb modelling and painting were characteristic of Meissen porcelain, and for the next 50 years, its products were unsurpassed, widely exported and much imitated. Initially, the factory made fine red stoneware, with relief and engraved designs influenced by baroque metalwork. The first true porcelain put on the market in 1713, was similar in style, in the form of teaware, statuettes, and Chinese blanc-de-chine-style figures. From 1720, the yellowish tinge of the early porcelain had given way to a brilliant white. This was the era of the painter-decorators, led by J. G. Höroldt, who improved enamel colours and specialized in fantastic chinoiserie designs. From the 1730s, exquisitely detailed harbour and military scenes were reproduced on a wide range of Meissen porcelain wares. In the 1730s, the sculptors, with JJ Kandler at their head, became dominant, producing a range of commedia dell’arte characters, animals and birds, dinner services richly decorated in relief, and sculptural vases and table wares. The Rococo style was perfectly in tune with the delicacy of Meissen porcelain. The more restrained neoclassical style dominated from the 1760s, but standards started to decline due to economic pressures and as the French Factory at Sevres began to make its mark. Throughout the 19thC, Meissen quality remained unchanged and there were few innovations, although the late 1890s and early 1900s saw the start of a more inventive approach in the art nouveau manner. Copies of 18thC figures were made but lacked the detail of the originals. Width: 3" Height: 6 3/4" Depth: 2 1/4"